Animal assisted therapy can play an important part in the rehabilitation process for patients with spinal cord injury or acquired brain injury. Shepherd Center "employs" multiple therapy dogs who bring joy to patients and also help with therapeutic exercises. In addition, they assist with tasks such as opening doors and switching lights on and off. 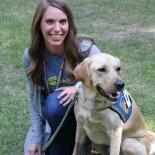 Shepherd Center exercise physiologist Mary Ashlyn Thiede discusses the role of therapy dogs and the benefits of animal assisted therapy.